A fine example of the U.S. Coast Survey's 1867 nautical chart or maritime map of Brazos Santiago, Texas. This map focuses on the Brazos Santiago Pass, a narrow waterway between South Padre Island and Brazos Island. This area provides access from the Gulf of Mexico to the Madre Lagoon, an excellent natural harbor. The map identifies military installations at the northern tip of Brazos Island as well as the Point Isabel lighthouse Supposedly the island was named in 1519 by Alonso Alverez de Pineda. Later the natural port became exceptionally important for military control of the region. In 1846, it was the first military objective of the U.S. Navy in support of General Zackary Taylor's invasion of Mexico. Control over this important seaport was said by Harvard historian Leroy Graf to be the primary reason for the U.S. aggression against Mexico. During American Civil War Union soldiers occupied the island and its strategic harbor. From this island they staged the Brazos Santiago expedition. This expedition led to Battle of Palmito Ranch, the last battle of the Civil War. 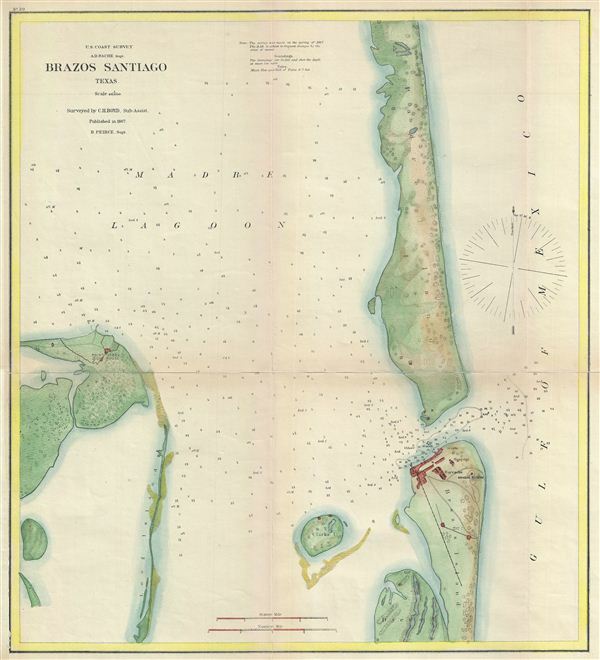 Issued under A. D. Bache for the 1866 edition of the U. S. Coast Survey Superintendent's Report.